I've recently handed in two essays for my masters, and here's a shortened version of one of them. 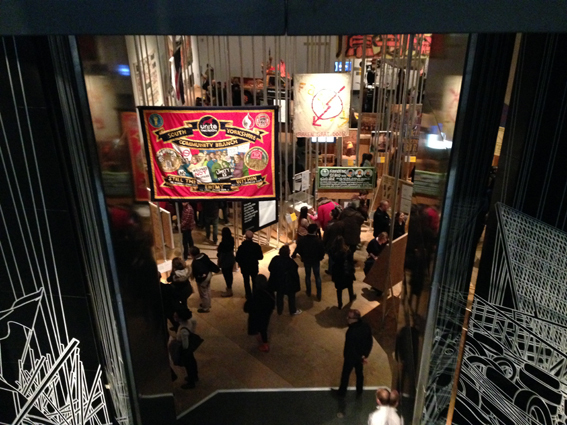 I decided to take a look at two quite different exhibitions in London - the just closed Disobedient Objects at the V&A and Designers in Residence 2014 at the Design Museum - to compare how each revealed the relationship between design and disruption, in ways not always intended. Selected by a panel of judges, the Design Museum's Designers in Residence, a group of emerging designers, spend seven months developing a body of work which is then exhibited in the Museum. Each year the Designers in Residence work to a theme, and in 2014 the theme was 'disruption'. According to Design Museum director Deyan Sudjic, who set the brief for the designers: 'More than most, “disruptive” is a term whose meaning is dependent on the context. It is conventionally considered almost a bad thing: difficult pupils, bad neighbours, ill-considered town planning. Yet disruptive innovation can interrupt established ways of thinking, diverge from traditional practices and propose new, unexpected ideas.' As such, the four designers – James Christian, Ilona Gaynor, Torsten Sherwood and Patrick Stevenson-Keating – have employed the notion of disruption in various ways to create products and proposals that are engaging and inquisitive. Architect Christian has proposed new shared spaces in which to live and work while Gaynor has disrupted the judicial system, hypothesising on how the rigging of the National Lottery could be communicated through a courtroom drama. Sherwood has invented an interlocking building toy and Stevenson-Keating has proposed a series of products to question how we interact with money and the economy. Each is an interesting project in its own right and has been developed over the residency to be a solid concept very well exhibited. Meanwhile, the V&A's Disobedient Objects takes a look at the role of objects, design and making in activism and social movements, exhibiting objects from around the world from the 1970s to the present, often by people not considered artists or designers. Co-curated by Catherine Flood, a Prints Curator in the V&A's Department of Word and Image and Gavin Grindon, Visiting Research Fellow at the V&A, the exhibition is also an opportunity to refocus the lens of design history: 'Objects have played a key role in social change alongside performance, music and the visual arts. Here the focus is on the previously under-examined area of the art and design of object-making within social movements, a people's history of art and design from below.' Disobedient Objects features a Bike Bloc used in protests at Copenhagen's 2009 Climate Summit, jewellery made by and for the Angola 3, a placard used in London's student protests against education cuts and rising tuition fees in 2011, work by art activist group the Guerilla Girls and more. It was an exciting and engaging exhibition that has seen in excess of 400,000 visitors, making it one of the most visited exhibitions the V&A has ever mounted. These exhibitions present very different exhibits for very different reasons. Each exhibition has developed from a distinct starting point and with different aims in mind. Their curators would never have intended these exhibitions to be similar, and a like-for-like comparison would do neither exhibition any justice. However, there are some key similarities in these seemingly disparate exhibitions. Disobedient Objects shows the importance of the made or altered object in acts of civic disobedience and social disruption. The object communicates that disruption, witnesses it, enables it or participates in it. Meanwhile, the theme given to the Design Museum's Designers in Residence in 2014 was 'disruption', asking the designers to consider disruption or use somewhat disruptive means to create design objects. 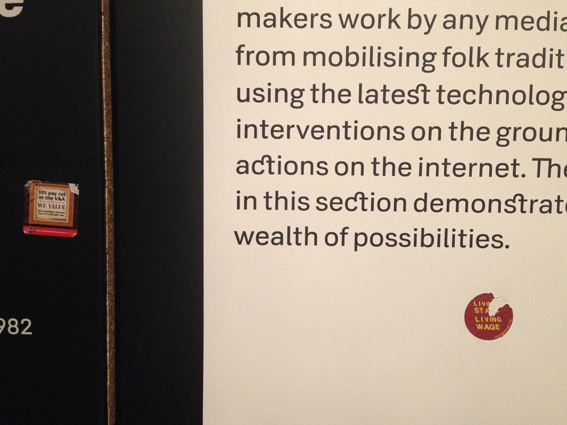 In Disobedient Objects design enables disruption, while at Designers in Residence 2014, disruption enables design. Exhibitions, as cultural artefacts, can capture our imaginations, elucidate our preoccupations and give insight into society as it is right now. I think that these two distinct exhibitions each point towards a growing need for design and our creative industries to play a greater role in society and politics, and that it is perhaps through disruption of the status quo that design might do this most effectively. 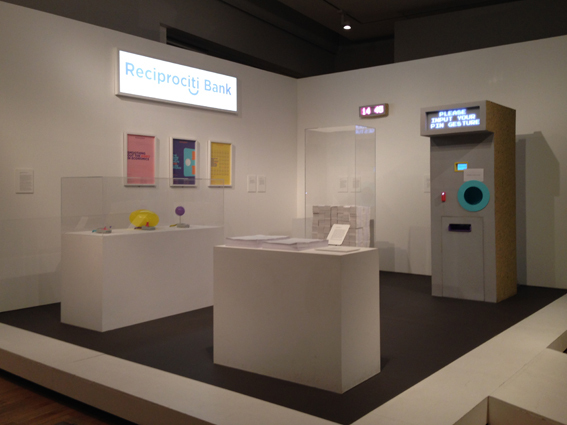 'My project has been designed to act as a sort of “economic playground”, a space where people can be free to explore and play with economic theories and objects without the constraints of the real world', says Patrick Stevenson-Keating, who combines an interest in objects relating to the economy – ATMs, credit cards, money itself – and our interactions with them to challenge the notion that there is no alternative to our current financial system. Questioning whether efficiency and profitability should be central to all our financial transactions, he has designed a series of products and services for a fictional bank called Reciprociti; services that would put social needs at their heart and objects that would make us give more time and thought to our financial transactions. His proposals include a series of card machines for online payments. With one, you insert your card, then crank its handle round and round until you reach the amount of money you wish to pay, thereby asserting small amounts of energy for small payments and more significant amounts for larger payments. With another, you insert your card and make your payment, then the balloon attached to the card reader deflates in accordance with the difference your payment has made to your account balance. Financial payments used to involve the handing over of physical gold, then became a little less tangible with the introduction of tokenistic currency, then less tangible still with the introduction of credit/debit cards and online payments. The Reciprociti card readers bring tangibility back with their need for physical activity and their visible, tactile responses. In addition to these card readers, with a range of differently functioning debit cards, a new currency, an ATM which uses stock exchange-style hand gestures and posters advertising a number of more people-friendly bank services, Stevenson-Keating shows how the design of tangible objects can alter our experience of something so abstract, and perhaps alter how we think about these things too. 'Exhibitions are places to be occupied, not just things to be observed'. 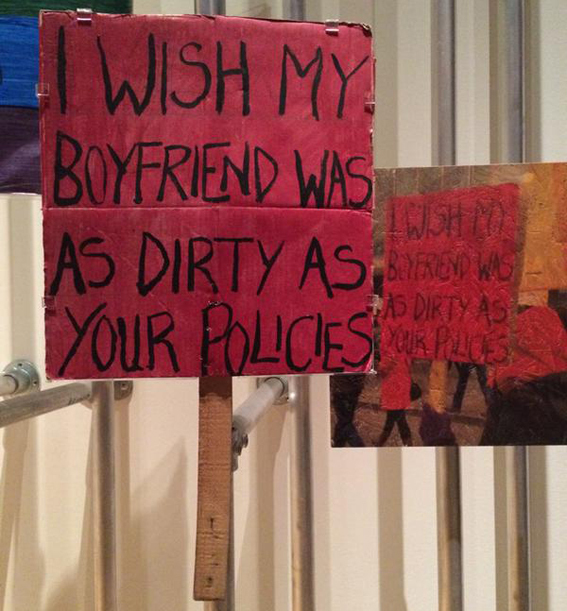 The Disobedient Objects show clearly had this sentiment at heart. 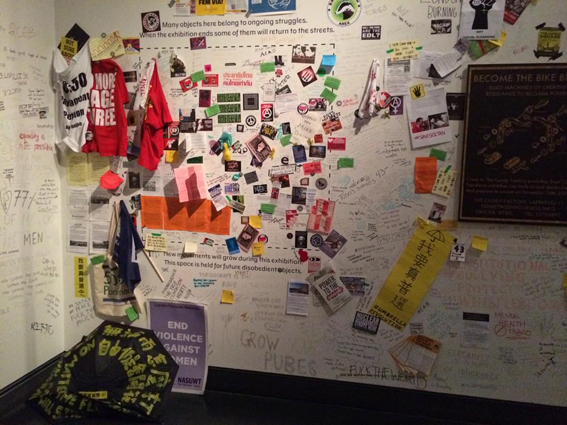 Disobedient Objects was open at an interesting – even serendipitous – time in society. Since it opened in July 2014 the world has seen the massive protests regarding Chinese governance in Hong Kong (one of that movement's disobedient objects – a painted umbrella – sits in the space for the 100th objects and is now in the V&A's Rapid Response collection), pay disputes in the V&A, the hacking of Sony allegedly instigated by North Korea, the recent violence in France leading to worldwide defiance in the name of 'Charlie' and much more. One of the most emotive ongoing struggles has been that in response to continued police brutality in the United States, centred around the town of Ferguson in Missouri. Recent and current struggles such as these cannot be easily represented in an exhibition which has taken years to research and plan, and yet a striking connection has come about between them in spite of that. As mentioned, Hong Kong is now represented in the V&A collection, and references to the struggles mentioned above – and many others – have been left in the exhibition's space for the 100th object. But most amazing of all is the use of the Disobedient Objects How To guides in demonstrations in other parts of the world. Through its How To guides, Disobedient Objects is participating in the spread of ideas and tactics common in the world of protest. As co-curator Flood says, 'I think as a form of design that's really interesting, this idea of collective and distributed authorship, so a group will make something in one city, people will see them using it and make their own version […] We very often hear of designs that have changed the world. I think these objects have a real claim to that and they're something people should really consider and pay attention to.' And while objects, tactics, slogans and hashtags spread around the world, the impact of Disobedient Objects does the same, shining a light on the design and making involved in social movements and changing the role of the museum in presenting it. There have been a growing number of calls in the media for us to stop using the word 'disruption'. Currently something of a buzzword in the design and technology industries, it's being accused of irrelevance through overuse. And while there is certainly no need to hail every new tech start-up, service or even app disruptive, there is a validity in certain claims – and calls – for disruption. The world as we know it – with society as it is and this economic system still in place – should not go on as we know it. There is much room for change and improvement, and disruption could well be the most effective, maybe even only, way to achieve that. And if design wants to play a meaningful role in things, perhaps a disruptive approach is just the way to ensure we do not continue more of the same products, experiences and processes, but rather contribute new ideas, products and spaces that really count for something. 'You can learn a lot about life if you look at design', says Paola Antonelli, Senior Curator of Architecture and Design at MoMA. Equally, I believe you can learn a lot about life if you look at exhibitions. Good exhibitions can tap into, express and perhaps even shape what is going on in the wider world. Both Disobedient Objects and Designers in Residence 2014 confront us with an image of society but they also urge us to shape it. They show us what the world looks like, invite us to question it, and they shape that world too. Whether that is through the commissioning of design which could change how children play, how people live or how we engage with finance, or through a bunch of How To guides and a call to arms, these two exhibitions have contributed not just to the London museums that hosted them, but to the wider world. 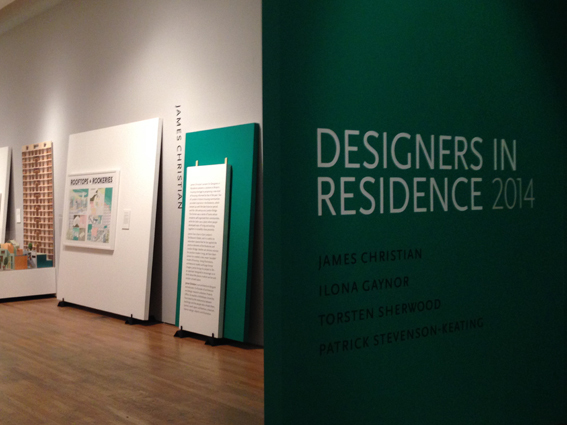 Designers in Residence is on display until 8 March and the closing date to apply to be a Designer in Residence in 2015 is 2 March. Disobedient Objects is now closed but the V&A has created an experiential film to accompany the exhibition which is available to view online.